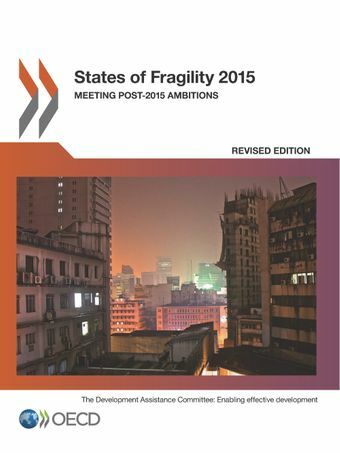 This 2015 OECD report on fragility contributes to the broader debate to define and implement post-2015 Sustainable Development Goals (SDGs). It points out that addressing fragility in the new framework will be crucial if strides in reducing poverty are to be made. It argues in favour of proposed SDG 16 – promoting peaceful and inclusive societies – which aims to reduce violence of all forms.The 2015 report differs markedly from previous editions as it seeks to present a new understanding of fragility beyond fragile states. It assesses fragility as an issue of universal character that can affect all countries, not only those traditionally considered “fragile” or conflict-affected. To do so, it takes three indicators related to targets of SDG 16 and two from the wider SDG framework: violence, access to justice, accountable and inclusive institutions, economic inclusion and stability, and capacities to prevent and adapt to social, economic and environmental shocks and disasters. It applies them to all countries worldwide, and identifies the 50 most vulnerable ones in all five dimensions. The group of countries most challenged on all five fronts differs little from the traditional list of fragile states and economies. Still, several middle-income countries with disproportionately high levels of crime-related violence, sub-national conflict or poor access to justice move into the spotlight.The report concludes that making headway on the targets will require building a new portfolio of tools and interventions, and an understanding of the role the international community should and can play in assisting this process.